The Bank of Montreal World Elite Credit Card is quickly becoming a top card in the Canadian marketplace. As of this writing, I would put this card as a strong competitor for the 2nd spot in my wallet, which I would use for my non-category spending. This card offers a great rewards earning potential of exactly 2% on all spending (redeemed towards the cost of travel). This card also has some great benefits, including a best in class travel insurance offering and a few airport lounge passes included in the annual fee. The fee is a hefty $150. If you value the lounge access or the travel medical insurance, then this could be a great card for you. The new version of the Bank Of Montreal World Elite Mastercard is quickly becoming my favorite card for non-category spending in Canada. It has a simple rewards structure, and it’s benefits are great for a card of this level. It is a Mastercard, so there is wide acceptance in the Canadian marketplace. The Bank Of Montreal World Elite card is the triple threat of credit cards, as it is competitive on all 3 of these. I think this is a good card to consider for people who have a significant amount of spending in categories other than gas, grocery and restaurants. Also, this is a great card for retirees who might need travel medical insurance or a few lounge passes each year. For many people who might be buying travel medical insurance out of pocket, the annual fee on this card will help reduce the costs of travel medical insurance. This is a very simple credit card rewards program in the marketplace. Every purchase earns the same return and rewards are deposited to your Bank of Montreal Rewards Account. When you are ready to, you can redeem your points travel purchases. The earning structure is very simple. You earn 2 BMO points for every dollar spent. These BMO points sit in your rewards bank until you are ready to redeem them. Rewards points will be earned at the end of the month in which they are earned, upon the closing of the statement cycle. There are a few ways to redeem your rewards. The way that you will extract the most value from your points is to redeem your points for travel purchases. This will yield the best return. You can also redeem your points for cash, but these will earn you a lower rate of return. To redeem your points, simply log in to the website at www.bmorewards.com. You are presented with a few options, including Travel. From there, you can book your travel using points. The great thing about this is that you can use up all of your points for a charge and if you are short rewards points, you can charge the difference to your card. There is no need to wait until you have enough points for a full ticket, before you can redeem. The problem with this structure is that you have to plan for your trip when you want to redeem. I really like the redeeming structure of other programs, like the Scotia Rewards card, where you can make your charges to your card, and then redeem your points for statement credits after the fact. You are limited to buying tickets from BMO’s reward site, so they are clearly not as valuable as points that can be redeemed for statement credits. Scotia’s redeeming structure makes it much more flexible as you can redeem your points for a statement credit against any charge coming from an airline, including taxes and fees on an award redemption, or a bus ticket, for example. If you are redeeming your rewards for non-travel merchandise or cash, this is not a very good card for you. You should get a card such as the Capital One Aspire Cash card which yields 1.25% cash back. Non travel rewards, such as merchandise will likely be very poor value. Cash and statement credits will cost you double the amount of points, making this card yield 1% return. Most merchandise redeemed through the Bank of Montreal site will yield less than 1% likely. Whenever I do rewards comparisons, I use this card as my basis for comparison. In this case, there are a few other cards that might be comparable to this one. I see this card as a cash-back-esque card with some great benefits. The points have an exact value which makes it very similar to a cash-back card. Also, I would use this card as a main spender for non-category purchases (things other than gas, grocery, restaurants). The MBNA Rewards World Elite and the BMO World Elite card are so similar that they even share the same name. The MBNA card earns 2 pts / dollar spent on all purchases and those points can be redeemed for statement credits against previously purchased travel. In this fashion, both the MBNA Rewards World Elite card and the BMO World Elite card have a very similar earnings. They only differ in how you can redeem your points. My personal preference is the MBNA method. The annual fee on the MBNA is slightly lower at $89, but I think there is value in paying the additional $60 to Bank Of Montreal for many people. The difference between these 2 cards is in the benefits. Again, the BMO World Elite card really shines as those travel insurance benefits and lounge passes are not available with the MBNA card. For those who don’t value either of these things, I think the MBNA card is actually a better fit. 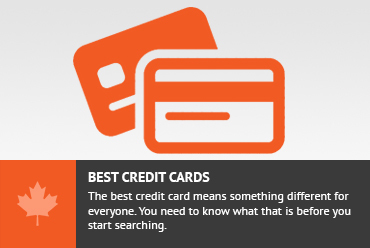 The other comparable card would be the Capital One Aspire World Mastercard. This card CAN get you 2% cash back in the form of travel, if you are willing to put in some effort when structuring your travel purchases. The annual fee on this card is $120, but you receive 10K points, which can be worth up to $100. If you redeem it right, then the annual fee can be considered to be as low as $20. The problem with this card is the slight annoyance in terms of the redemption of rewards. You might be able to get 2%, but in all likelihood, you will earn slightly less than that. The additional benefits of the Capital One card, such as the travel medical insurance and lounge access benefits are not quite as good as the BMO World Elite card. The travel medical insurance covers you for up to 22 days if you are under 65, and up to 8 days if you are over 65. The Capital One card also does not come with lounge access. The Scotiabank Gold American Express card is one of my favorites. This card gets you a high return in gas, groceries and restaurant categories. I don’t put these against each other, and actually would say these 2 cards complement each other very well. In my suggested 2 card wallet, I would put these 2 cards as my preferred cards for many people. Put category spending (gas, groceries and restaurant) on the Scotiabank American Express, and everything else on BMO card to maximize your return. If you have enough spending (say $1500 / month) in non-category spending, the World Elite is great. Also, the lounge access that comes with the Scotiabank card is to access the Priority Pass program for $65 / year and an additional $27 / visit. If you are interested in taking advantage of the Scotia program for lounge access in any way, the BMO card is well worth it. Also, there is no fee for an additional cardholder. There is a signup bonus of 30,000 points after the first purchase. This can immediately be put towards a ticket worth $300 or more. This card comes with some extraordinary benefits, namely the travel medical insurance and the 4 lounge passes each year. If you are over 65, travel medical insurance tends to be very expensive so getting access to this coverage, with no medical questionnaire is a great benefit that is not offered by many other cards. The coverage is also capped at $2M, while many other cards cap it at $1M. 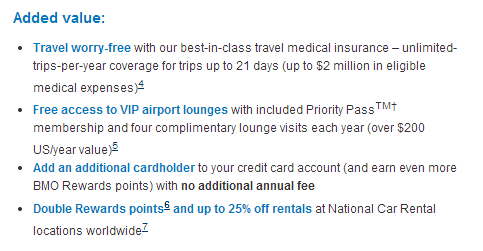 Some cards offer a discount on Priority Pass, which will give you the ability to pay to get into the lounges. The BMO World Elite will pay for your membership fee each year (worth at least $65). Each time you access the lounge with Priority Pass, it will cost you $27. With the BMO World Elite card, you get 4 of these passes each year. The BMO World Elite card gives you access to double points for charges from National Car Rental. I don’t think this is too significant but it can add up if you rent from National Car a lot. You can earn exactly 2% back on all your purchases, which will be redeemed against travel purchases with no restrictions. What you receive with this card is a Priority Pass membership that comes with 4 passes loaded onto the card. Read up on my discussion of the lounge access programs. 1.) Although the MBNA World Elite Mastercard has the same points earning as the BMO card, there is a $25 fee applied for all redemption under 10,000 points. The BMO World Elite Mastercard is fantastic for travellers who set travel budgets, and uses the points to keep flights, car rentals and/or flights within that budget. Whether an individual redeems 1 point or 30,000 points, the redemption service is free (on the BMO Reward website). 2.) The BMO Reward website uses a system that is very similar to MBNA and TD Visa (which I believe is based on the same engine as Expedia), that allows individuals to reap the benefits of seat sales and special pricing for hotel bookings. One more advantage with the BMO World Elite: You can get Emerald Status at National Car Rental for no additional fee. You have to apply for it via the National Car Rental website, but it is well worth it!! I usually save about $300 per week on a car rental just by having Emerald Status. Again, well worth the $150.00 annual fee for the credit card!! Great point! That could be worth some huge savings if you can leverage it. I am going to make sure to sign up for that right now as I have a car rental coming up myself. How exactly do you take advantage of Enterprise Emerald+bmo world master elite? If so are they better than the already lower Thrifty rent a car that process upgrades at 50% of the upgrade cost( feature that world master elite has)? In other words, what seems to be the best combination for you especially if you are looking for car rental options within north america? I hope customer service is better than with their regular credit card. I’ve been on hold 45 minutes only to talk to someone that couldn’t verify my account by asking me questions like ‘What investment do you have with Bank of Montreal’ (guess what, more than one) or ‘What kind of bank account do you have’ (guess what, more than one). Now I’m directed to go into a bank which is closed for two days since they don’t open Sunday or Monday long weekend) Come Tuesday I’m cancelling all my accounts with them and transfering my mortgage and investments with a more ‘customer friendly’ bank. I swear I was talking to someone in India. I need a prescription filled for antibiotics and WILL NEVER deal with them again. I have only had good experience with them but every situation is different. I also have not really had to deal with customer service so I can;t really comment. Unfortunately, this didnt work out for you. I hope others have better experience with customer service at BMO. Agreed. BMO world elite good reward, bad customer service with Indian style of business. Use BMO card with extreme cautious. Really want worry free travel experience and anti fraud experience. stay with AMEX as much as you can. The 4 passes that come with the card – are they transferrable? i.e. can I use 2 passes at the same time to go into the lounge for myself & my spouse? Those 4 passes come in the form of a Priority Pass Membership with 4 passes attached to it. In my experience, I have been able to use 2 passes at a time. 1 for me and 1 for my guest. However, at the entrance to the lounge, they were very strict about matching the name on the boarding pass to the name on the Priority Pass membership. My experience was in Sao Paulo (GRU) Airport. I don’t know what kind of experience people have in North American airports. It seems that like most other insurance companies, BMO World Elite master card and their side kick “Allianz” tried to weasel out of paying. I suggest potential card holders think twice before applying for a BMO World Elite travel master card even though they claim that they have the best in travel insurance. I too purchased tickets for my family to travel to Hawaii in August 2014 and one member could not make it. The cost of air travel was a little over $900/- each. I had to cancel one ticket prior to flying. BMO Allianz (their insurance arm) sent me their forms which I duly filled. Their form clearly stated that their medical form was to be filled by a doctor or a doctor from a hospital. Knowing that hospital visits could take 6 hours or longer, I got the form filled by my family doctor. BMO”Allianz” (their insurance arm) declined my refund claiming that I should have had the form filled by a doctor from the hospital. They are now giving me the run around. “BMO Allianz” are now passing the buck to World Elite mastercard. Earlier this year, I was approached by BMO mastercard to apply for their mastercard, I did not talk to BMO Allianz first. As a customer who bought tickets through BMO mastercard travel agency, I should only deal with BMO mastercard. It is BMO master card who should deal with their insurance arm. Before applying for a BMO card, BMO claimed that “World Elite” has the best travel medical insurance along with many other benefits. This is hogwash. Why is BMO in business of insuring travel – just to sell their mastercard when they have a team to try and weasel out of paying.? As of now I am still awaiting a final response from BMO master card and if they decline payment, I will take my case with BMO ombudsman and withdraw all my bank accounts, BMO Harris Bank investment accounts, Investor’s line account and US private harris bank account. Thanks for the data point. Unfortunately, this happened to you but it can be a cautionary tale for others. Insurance companies are always trying to get out of paying for claims that are not legitimate and sometimes (often) they dont pay on claims that are legitimate. Take this up with the ombudsman. If you have followed the instructions properly and to the best of a reasonable person’s ability then the ombudsman should rule in your favor. Ironically, this claim (assuming it is legitimate) is going to end up costing BMO / Alianz so much more fighting this than the $900 for your claim. This just makes the insurance that much more expensive for everyone involved. This is also a good note that if BMO / Allianz are not actually providing insurance, but simply advertising it, then this card should take that into account. If you bank with BMO, and switch to their Premium plan (fees waived for $5,000+ account balance), you get the World elite card for free, as it an annual rebate is applied. That is actually really good to know. I hadnt learned that and nobody at BMO in any way informed me of that. That is a great point to consider. I know that TD waives the fees on their card if you have a select service account and the BMO World Elite card is many steps better than TDs best card (in my opinion). For me, personally, I might consider the benefits of BMO instead of TD for this purpose. My experience with this card was not great. Their flight prices were not competitive and wouldn’t price match because they said it was from a travel agency (I used online Flight Network). I booked my flight directly with FN, planning to apply the $700 in points I accumulated over the year towards the cost. Not only was the service representative sarcastic and unprofessional, to top it off, if you want the points transferred to a bank account, you must open a specific BMO account and they only give you half the value of your points. GRRR! Not a happy customer and will be cancelling this card immediately. Don't subscribe All Replies to my comments Notify me of followup comments via e-mail. You can also <a href='https://www.creditwalk.ca/comment-subscriptions/?srp=1302&srk=2648578ecea05c83754707575dc5a494&sra=s&srsrc=f'>subscribe</a> without commenting.